The old film spooling through his projector takes us back another 70 years, when he, a young, feckless entrepreneur called Julius Bedford (Rory Kinnear) first meets the eccentric Professor Cavor, played by Gatiss. Thanks to this neat framing device, what was once obsolete sci-fi is now alternative history. You immediately find yourself thinking: what if the Edwardians had been to the moon? What follows is remarkably faithful to the Wells novel, which Gatiss treats playfully, but without sticking his tongue in his cheek. Making a virtue of the story’s anachronisms, he plays the whole thing more or less in earnest. The science that makes Edwardian space travel possible (it’s all down to “cavorite”, a substance of the professor’s invention that blocks the effects of gravity) may be preposterous, but it’s still carefully explained. When Cavor lectured Bedford on how their cavorite-coated spaceship might be piloted using roller blinds, I felt I understood perfectly. Gatiss and Kinnear have great fun fleshing out two rather bloodless characters, with Kinnear exploring the hidden shallows of the incurious, unscrupulous Bedford, and Gatiss imbuing the professor with several alarming tics. In exploring the idea of putting a man on the moon more than a century ago, the story reminds us how crazy the idea still seems: 40 years after it actually happened, there are still people who don’t believe it. The scenes focusing on the preparation for the voyage were a bit like a live action version of Wallace and Gromit’s A Grand Day Out – the ship’s interior is just as cosily appointed. As with the later dream sequence recalling Georges Méliès’s silent film Voyage Dans la Lune, it was a strange kind of inverse homage: Wells provided the original inspiration in both cases. Up on the moon (sorry, in the moon), however, the drama hits a soggy spot. The ant-like Selenites, intelligent but fragile (literally – you punch them and their heads explode) beings that populate the moon’s core, are a little unconvincing, and the plight of the captured space travellers correspondingly unengrossing. It looks as if Gatiss decided to give his creatures a retro, Harryhausen-style flicker, and it’s the one false note. Alien encounters are handled with more verve in Doctor Who. Once the double act of Bedford and Cavor is broken up forever – the former escapes, the latter is marooned – the narrative runs out of steam. What remains is essentially a long epilogue. It’s worth staying on, though, to see how cleverly Gatiss ties everything up. Back on Earth, Bedford receives an explanatory radio transmission from Cavor (that was Wells’s idea, actually), telling him how he has inadvertently set in train a plan by the Selenites to attack Earth. Cavor sets off a heap of cavorite to destroy them, which explains why there is no atmosphere – or ant people – on the moon today. Naturally, no one ever believes old man Bedford’s ridiculous moon-landing tale, even though he has the kinematographic evidence to prove it. “They say I must have faked it all in a film studio,” he tells the boy. 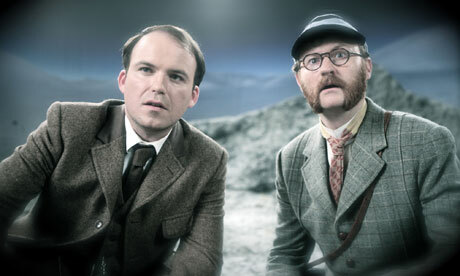 Gatiss has taken a well-worn piece of science fiction and turned it into an engaging slice of time travel. He deserves some credit for that, bearing in mind that Wells invented time travel as well.